This is a very special piece to me. It was my Grandma's sugar bowl. It was originally given to my Grandma by my Mom...well before my time. It had a permanent place on the kitchen table at my Grandma's home. When I see it, I think of her. It isn't in the best condition. There is a chip here and there, and there is the place that my Grandpa needed to do some gluing to piece it back together. Isn't it a wonderful sugar bowl? 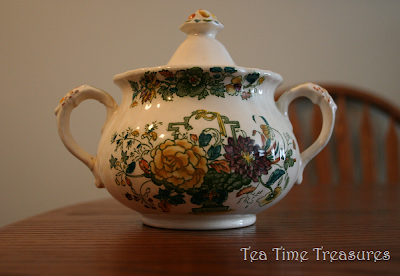 I am so fortunate that this sugar bowl now lives in my kitchen. What a wonderful reminder it is of my Grandma ... I can think of her whenever I add some sugar into my tea!